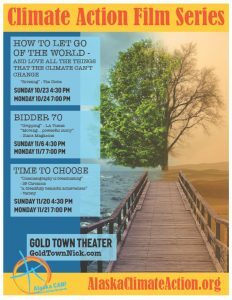 HOW TO LET GO OF THE WORLD: In How to Let Go of the World and Love All The Things Climate Can’t Change, Oscar Nominated director Josh Fox (GASLAND) continues in his deeply personal style, investigating climate change – the greatest threat our world has ever known. Traveling to 12 countries on 6 continents, the film acknowledges that it may be too late to stop some of the worst consequences and asks, what is it that climate change can’t destroy? What is so deep within us that no calamity can take it away? BIDDER 70: On December 19, 2008 Tim DeChristopher disrupted a highly disputed Utah BLM Oil and Gas lease auction, effectively safeguarding thousands of acres of pristine Utah land that were slated for oil and gas leases. Not content to merely protest outside, Tim entered the auction hall and registered as bidder #70. He outbid industry giants on land parcels (which, starting at $2 an acre, were adjacent to national treasures like Canyonlands National Park), winning 22,000 acres of land worth $1.7 million before the auction was halted. Refusing to back down, Tim flew to D.C. in April 2011 to give a keynote speech at Power Shift 2011 in front of 10,000 students. He then led students to occupy the Department of the Interior. Tim wisely avoided arrest, but dozens of others were arrested for this mass act of peaceful civil disobedience. On July 26th Tim was sentenced to two years in federal prison and removed immediately from court in chains. Tim is serving the remainder of his sentence. TIME TO CHOOSE: Academy Award®-Winning documentary filmmaker Charles Ferguson (Inside Job, No End in Sight) turns his lens to address worldwide climate change challenges and solutions in his new film TIME TO CHOOSE.